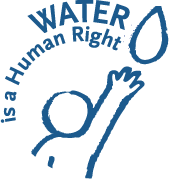 The European Water Movement is a pluralistic network of social and environmental organizations, committees, and unions whose goals are water protection, application of the human right to water and recognition of water as a commons in Europe. Members of the European Water Movement were on the people’s side struggling all over Europe against the extraction of shale gas by fracking, in order to preserve the water resources of their territories and their living environment. These struggles have been partially successful as fracking is now banned in several European countries. Consequently, the European Water Movement can only be in solidarity with the Sioux community of Standing Rock, which is fighting against the crossing of its territory by the Dakota Access Pipeline. This pipeline is a direct threat to the water resources and livelihood of the Sioux. The Sioux, who call themselves “protectors of water”, demand nothing but respect for the treaty, attributing to them the territory that would be crossed by the pipeline. The only answers they have received so far are violent attacks of their camps by the Dakota police and the security services of Energy Transfer Partners, recalling the darkest hours in the history of the Great Sioux Nation. Mr. President, before the end of your term, listen to the Sioux community of Standing Rock and cancel the building permit of the Dakota Access Pipeline. It is still time. As the EU Council and the European Parliament are about to vote the free trade agreement between the EU and Canada (CETA), more questions are raised about its impact on water as a resource and on water services. European and Canadian organizations had access to a list of questions raised by the Slovenian Government to the European Commission . The organizations on its side sent a letter to EU governments raising their concerns . David Sánchez, from Food & Water Europe said: “CETA will open the door to corporate grabbing of water, and push further commodification of water resources. Also it creates new legal uncertainty for public authorities delivering water services”. A draft joint interpretative declaration has been circulated and there possible impacts on water are denied. 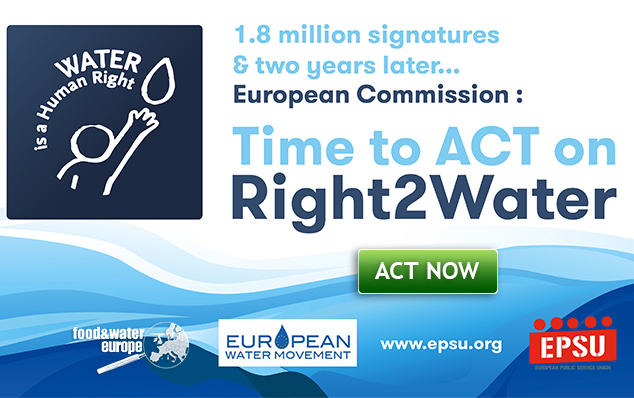 Together, we have been campaigning for many years to implement the Human Right to Water and Sanitation in Europe. We collected signatures — nearly 2 million. In December 2013 we delivered them to the European Commission, which disappointed all of us with their answer. With your support, we campaigned to get a strong resolution from the European Parliament in 2015. Our demands were also backed by the European Economic and Social Committee. The European Water Movement says Irish campaign to forefront of “European movement to democratise water” and funding through progressive taxation best way to secure human right to water. Ahead of the national Right2Water demonstration set to take place this coming Saturday (September 17th), the European Water Movement today said that the Irish Right2Water movement forms part of “a real movement of people to democratise water management and achieve the human right to water that no country in the EU has yet implemented”. The European Water Movement, a network of organisations whose goal is to reinforce the recognition of water as a commons and access to water as a fundamental universal right, made a submission to the Expert Commission on Water which is available here. In a statement issued today, the European Water Movement said: “It is clear that the best method of securing access to water, and securing funds for infrastructural investment, is through general taxation“. “The European Water Movement views the struggle of the Irish people to abolish water charges, and to secure a referendum enshrining public ownership of Ireland’s water system, as yet more evidence of a real European people’s movement to democratise water management. Ireland’s Right2Water campaign, like other campaigns throughout Europe, is seeking to achieve the human right to water that no country in the EU has yet implemented. Right2Water is to the forefront of this growing movement”, the statement concluded.